Pepsico (PEP) shares have soared over 25% over the last three months. But now it looks like the rally may have come to an end, and there could be a 50% retracement of those gains. After establishing a low in May the stock price began making a steady series of higher highs and higher lows. On August-6 a doji candle formed signalling a potential peak in the price. A doji candle is a high wick candle with a narrow opening and closing range. They are often seen at stock reversal points. The doji was followed by a lower high and then a retest of the $112.50 area. This completed the formation of a head and shoulders top, with the July high as the right shoulder, the doji as the head, and the lower August high as the left shoulder. 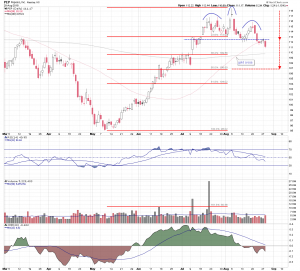 Neckline support is situated in the $112.50 area and is currently intersecting with the 50 day moving average. A head and shoulders top is a common formation seen at important stock market tops. 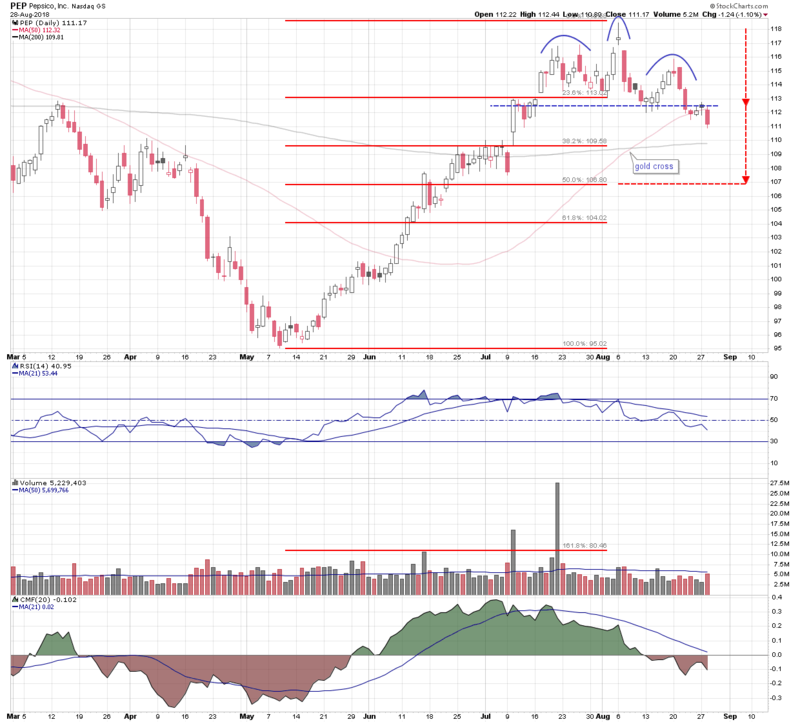 Neckline support was broken last week and retested this week. Tuesday’s large dark candle suggests the retest failed and that former neckline support is now resistance. The head and shoulders pattern projects a downside price objective. It is measured by taking the height of the pattern and subtracting it from the neckline. In this case, it targets the $106.80 area which is also the 50% retracement level of the previous rally range.